By CANDELA DIAS, FELICIA FALLANO, and JULIA PARKER Nelson Mandela was well known to the world as a brave and generous man who changed South Africa and the hearts of many. Putting racial and cultural issues aside, millions came together in a moment of silence honoring his recent death on Dec. 5th, 2013. Known for his work against segregation in African countries, a great number of lives were changed which makes him a majorly loved historical figure today. Nelson Rolihlahla Mandela was born in Mvezo, Union of South Africa, on Jul. 18, 1918. 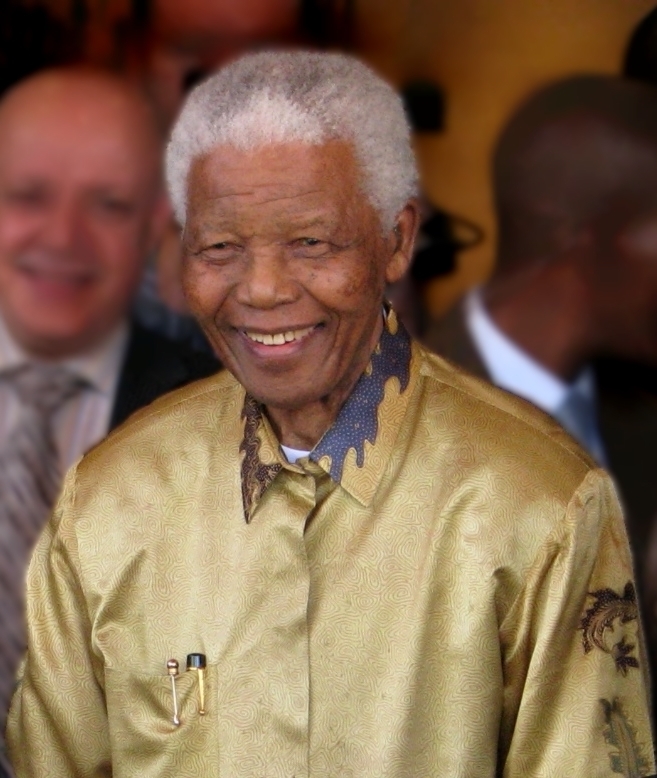 Known for his revolutionary stand against racism in his home country and around the world, Mandela spent 27 years of his life in jail because of his disagreement with the government of South Africa during a period of time called apartheid. Mandela was married three times. His first wife, Evelyn Mase, was married to him from 1944-1958, having two sons (Madiba Thembekile and Makgatho Mandela) and two daughters (both named Makaziwe Mandela). The two divorced when Mase asked Mandela to decide between her and his work in the African National Congress Liberation movement. He attended the University of Witwatersrand, where he began his studies in law. There, Mandela met many people like Anton Lembede, who later went on to inspire Mandela to put an end to apartheid. Making up only about 10% of the population back then, whites controlled the country of South Africa in what was known as apartheid. A series of laws were made affecting people by their race. Colored people were put in a different place to live with others of their same race; it created separate beaches, buses, hospitals and schools for those who were white. Education was affected, as negroes were being designed to grow up to become laboring men and women. His first imprisonment happened in 1962 for “leaving the country without permissiom,” where he was held in Johannesburg’s Marshall Square prision. Later, in 1964, Mandela and a colleague were sentenced to life imprisonment; afterwards, they were transferred to a prison on Robben Island, where they spent the next 18 years. By 1975, Mandela was a Class A prisoner, meaning he could receive more letters and visits. Mandela began writing his autobiography, which he secretly sent to London. It was not published, and once prison authorities found out about it, Mandela’s study privileges came to an end for four years. As his fame grew worldwide, Mandela was transferred to Pollsmoor Prison in Cape Town. Him and seniors from the African National Congress (ANC) believed they were brought to that prison to isolate their influence on young activists. For two years, Mandela resided in Victor Verster Prison. When president of the ANC, P.W. Botha, suffered a stroke, he was replaced by F.W. de Klerk. Anti-apartheid president de Klerk released all ANC prisoners, except Mandela. Later, de Klerk organized a meeting to discuss the release of Mandela, and later met with Mandela before officially legalising and releasing him. On Feb. 11, Mandela stood in front of millions, giving a speech declaring his actions “against the violence of apartheid” and his fight to negociate with the white minority but to also bring peace to the black majority. After being freed from prison, Mandela began a tour to encourage countries to help end apartheid in South Africa, and held a benefit concert known as “Nelson Mandela: An International Tribute to Free South Africa.” From American president George H.W. Bush to Pope John Paul II, Mandela did his best to include as many international countries around the world as possible. In Dec. 1991, as a part of the Convention for A Democratic South Africa (CODESA), Mandela began meeting with heads of important companies. Later on, de Klerk and Mandela went to meet with then-President Bill Clinton. They both received the Liberty Medal, and were awarded with the Nobel Peace Prize in Norway. Nelson Mandela with U.S. Congressman Eliot L. Engel. Years passed, and the election of 1994 was on its way to a huge impact. The first black president was elected by South Africa: Mandela. Mandela’s reign lasted for five years, as changes in the political party were crucial to end apartheid. On Apr. 26, 1994, the first multiracial presidential election had an attendance of more than two million people at the ballots. Nelson Mandela with U.S. Congressman Eliot L. Engel.For years, Mandela wished to gain rights for black South Africans. Mandela used his non-violence philosophy to end apartheid in South America. He believed that people weren’t born to hate, they are taught and if someone can learn to hate, then they can learn to love. Four years after he got released from prison and became president of South Africa he chose white man, F. W. de Klerk, to be his vice president. Lying in his grave, finally at peace, Nelson Mandela will forever be remembered, not just in textbooks, but in the hearts of millions. As blacks in South Africa are given their full freedom and their rights as people, his work is finally done.